Speed of an AGP bus is always backwards compatible. For example, a 4x device must be able to run at 2x and 1x. No compatibility issues here. Both the AGP slot on the motherboard and AGP video card must signal at the same voltage to function. Different speeds require different signalling voltages for operation. For example, AGP 8x signals at 0.8V, while AGP 1x can signal at 1.5V or 3.3V. Physical keys in the connector and slot dictate which signalling voltages the devices is capable of operating at. AGP connectors and slots are physically keyed to specify the signalling voltages the device is capable of operating at. AGP specifies two keys, a 3.3V key and a 1.5V key. Unfortunately they added a third voltage, 0.8V. If a device operates at 0.8V it uses the 1.5V key and must be tolerant of 1.5V signalling, but not necessarily capable of operating at 1.5V. A key is manifested as a raised area in a female connector or slot and a gap or absence of pins in a male connector. The keys physically prevent an electrically incompatible AGP video card from being inserted into an AGP slot. If a device has the 1.5V key and claims operation at 8x speed you know that it is capable of 0.8V operation. 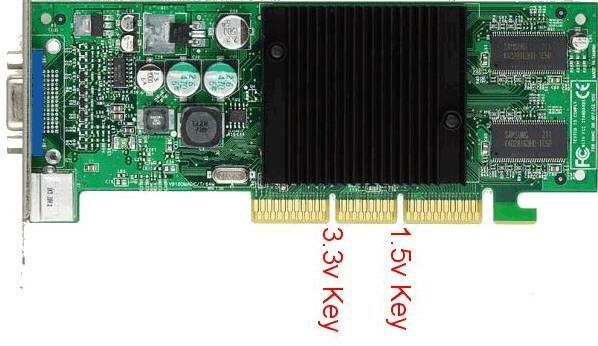 AGP Pro is a extention to the standard AGP connector and slot on both sides to provide additional power to an AGP card. It comes in two flavors, AGP Pro110 provides for 50-110W of power and requires two adjacent PCI slots for cooling. AGP Pro50 provides for 20-50W of power and requires a single adjacent PCI slot for cooling. An AGP video card will work in an AGP Pro slot, however the card must have a registration tab.